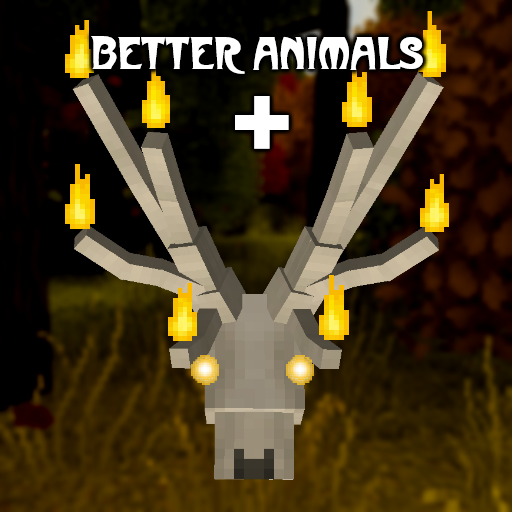 Better Animals Plus adds a variety of animals and mobs to create an immersive gameplay experience. Better Animals Plus adds many animals and items to the game. Check out this video from Ulandos on the mod (version 5.0.1)! Have a language you'd like to contribute? Find or create an issue on our GitHub (see issues tab above) and we'll give you information on how to contribute. Questions: Check the FAQ, Ask in our Discord, or check out the rest of the Wiki! Track planned features and development progress on our Trello! Below is a collection of frequently asked questions. Can I/How can I tame the animals? Goat: The goat is not tameable in the traditional sense (attacking it will cause it to retaliate!) but feeding it any sort of animal foods (wheat, carrots, apples, etc.) will cause it to become "friends" with you and protect you if you are attacked. What is the use of the Hand Of Fate? The Hand Of Fate is a block used to spawn the Hirschgeist and as lighting. It can be lit on fire with flint and steel and put out with sand or a water bucket. How do I spawn the Hirschgeist? The Hirschgeist can be found rarely in Forests or it can be spawned with the Hand Of Fate. will summon the Hirschgeist from its world to here. Trillium serve as a decorative item, like any flower in the game. I can't hurt the Hirschgeist, it won't attack me, and there's no ghost part? The Hirschgeist will only attack during the nighttime. If you are using version 1.0.0 and it will not happen during nighttime, update to 1.1.0 or use /time set 13000. How do I craft Goat Cheese? Goat Cheese can be crafted by using one bucket of goat milk (use a bucket on a goat in survival mode) and any type of mushroom (red or brown) in any configuration in the crafting table. For this, you will receive three goat cheese. See Goat for more info. The assets (textures, models) in Better Animals Plus are reserved to Cybercat5555, and cannot be reused or recreated without permission, unless within fair use. The source and binaries (jars) are licensed under the CC BY-SA-NC 4.0 IPL (see "License" above). This is one of the most well-described and presented mods on Curseforge. I salute you guys. There is no way to breed bears, but I believe I commented somewhere earlier about breeding, check the older comments. Is there any way to heal the bearded vultures? Yes, you can feed them meats. I know mutton definitely works although others should. Can also always use a splash potion of healing. so when your mods animals spawn, do they replace the vanilla animals? I made a world and i can't seem to find many vanilla animals besides wolves. No, of course not. I'm not sure why you're not noticing vanilla animals, but it could just be a result of our entities outweigh the amount of vanilla entities in the spawnlist, so therefore ours are more likely to spawn over vanilla ones, by simple random weighting. could be the spawn weighting or maybe the biome mod i have might mess with spawns. Biome mods are generally working after 5.0.2, which fixed the lack of entity spawns in modded biomes. You can also try lowering the weights in the spawning config. How to obtain the animal heads? It's not increased by looting currently, but yes, 1/12 drop chance. Hello! I was wondering when you have a spare moment if you could think over allowing the foxes to be tamed as pets? And have the option to let them roam or follow? I love foxes very much and wanted to ask. They are tameable already! Feed one raw rabbit or raw chicken.